Not to be confused with Pitifall. Traps opponents in the ground. A Pitfall (known as a Pitfall Seed in the Animal Crossing series) is an item that appears in Super Smash Bros. Brawl, Super Smash Bros. for Nintendo 3DS / Wii U and Super Smash Bros. Ultimate, bearing the same appearance as it had in the Animal Crossing series, from which it originated. 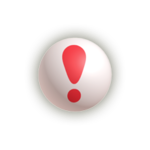 Pitfalls are white balls with a single red exclamation mark on them. They are used in a similar manner as they are in the Animal Crossing games; once a pitfall is thrown on the ground, it will be buried and become completely invisible, with no change in the terrain. If a player walks over the spot in which the pitfall is hidden, a pit will open up under them and they will fall in, immobilizing them and leaving them open to attack. Pitfalls can also be set in suspended platforms. In this case, if a player walks over the spot where the Pitfall is hidden, they will fall through the platform. However, they will not be buried if the main platform is below them. If a Pitfall is thrown at an opponent while they are in the air, the Pitfall will send them straight down. Pitfalls will not affect the player that set them. They also don't have any effect on Giga Bowser, who is resistant to flinching, and Wario-Man, since he is invincible. GCN Animal Crossing A tricky little item you can bury. Any player who passes over it will drop into a hole. If you land in a pitfall, move the Control Stick quickly back and forth to escape, because until you do, you're completely defenseless. In Animal Crossing, this item also dropped passersby into holes. It was a thrill to bury one and wait for a visiting pal to stumble across it. 3DS Animal Crossing: New Leaf (06/2013) You can plant this in the ground as a trap against your enemies. If they set it off, they'll be rooted in place and at your mercy. If opponents are spending too much time in the air, throwing this at them can send them meteoring down to the ground–or better yet, right off the stage! The Pitfall looks similar to a Surprise Ball from the Yoshi franchise, although the colors are reversed. Oddly, if Wario hits a buried Pitfall while using his Wario Bike, he'll be sent flying for an instant KO. If someone is buried by the Pitfall on a thin platform, half their body will be seen under it. This page was last edited on March 13, 2019, at 23:39.